Welcome to the Jungle! We’ve got fun and games. 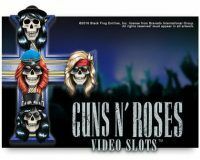 After a long wait, the much-hyped Guns N’ Roses video slot by Netent has finally arrived. After months of building up the excitement, the biggest Rock and Roll band of the last decades has got its video slot. This dirty, sleazy and downright hard rocking band knew how to live as true rock stars, with multi-million best selling albums, sold out tours, decadent parties, plenty of “creative differences” and more trashed hotel rooms since bands like The Who and Led Zeppelin ruled the world. Except for their own slot machine. Luckily for us (and Axl), Netent decided to change that. Of course, the big question is: does the Guns N’ Roses slot live up to the hype? Was it worth waiting for? In one word: yes. In three words: yes, yes, yes! Visually, the Guns N’ Roses is gorgeous. There are a lot of classic Guns N’ Roses details such as picks with the Use Your Illusion and Lies album covers on it. The images of Axl, Duff and Slash look fantastic as well. The wild symbols are made out of the so well known yellow band logo. Press the spin button, and you will see a “playing the drums” effect. The crowd is in the background swaying to the music, and you can feel (and see) their excitement swells once you get a big win or a bonus feature. The bonus symbols are made out of silver records that light on fire if they hit. A lot of love and hard work has been put into this slot by Net Entertainment. Brilliant stuff indeed. The option to give each session your personal touch is a great find by Netent. Do you feel like some old-fashioned headbanging? 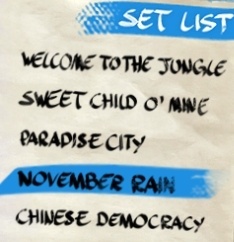 Go for “Welcome to the Jungle” or the epic “Paradise City”. Prefer something a little more mellow? The hauntingly beautiful “November Rain” is your perfect choice. 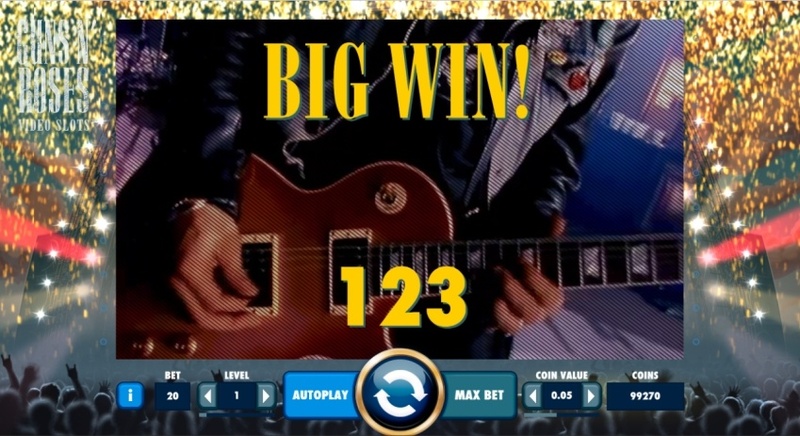 How does the Guns N’ Roses slot work? The playing grid consists of five reels with three symbols each. The number of win lines is fixed at twenty, and there is a minimum stake of $0,01 per win line. As is usually the case with Netent slots, you can both alter your bet level and your coin value. The minimum bet size is $0,20, and the maximum bet is $200 per spin. This makes Guns N’ Roses the perfect choice for all types of player, from low- to the high rollers. 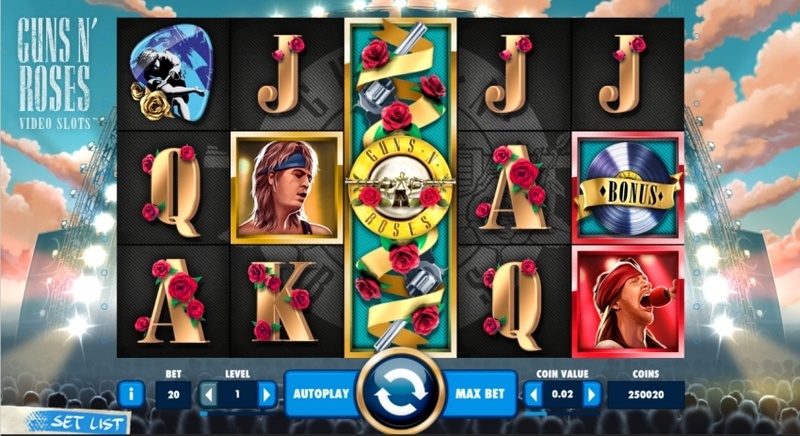 If you like slot bonuses, you are going to love the Guns N’ Roses slot. There are a lot of mini bonus games as well as a great main bonus feature. We have counted no less than seven different bonus features, each with its distinctive charm and fun factor. The only bonus feature that we don’t like that much is the Guitar Multiplier bonus. If you manage to land one or more Guns N’ Roses logo, the entire reel becomes wild, often leading to big or even mega big wins. 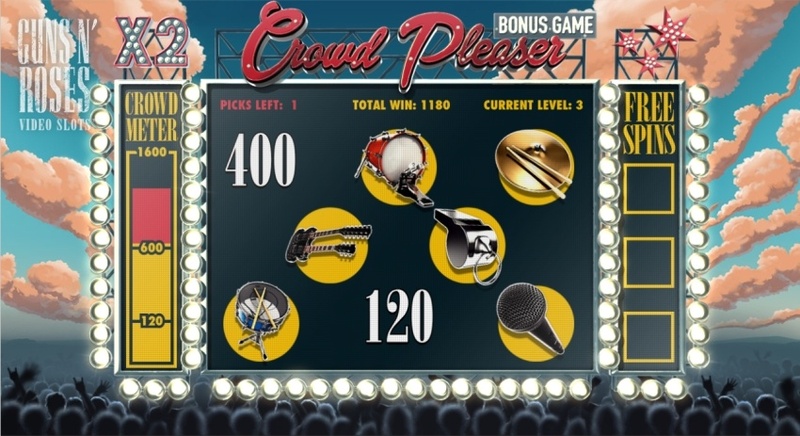 The Crowd Pleaser bonus is an enjoyable pick em bonus, where you get three picks in each round. 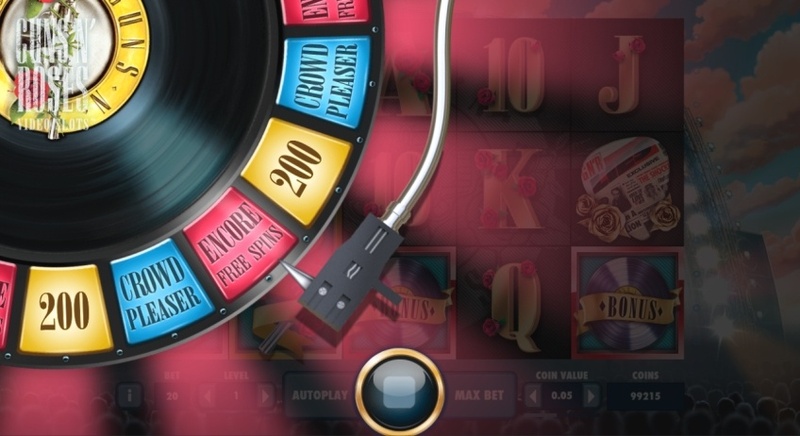 Try to find free spins, extra picks and big credit prizes hidden beneath the Rock symbols. Get enough credits, and you will progress to the next round, with even bigger prizes. Make it to the end of the bonus and your credits will be doubled. If you have collected three Free Spins symbols along the way, you will get an extra Encore Free Spins bonus. A random free spins bonus where you get 10 free spins. Every spin comes with one reel wild with alternating band members. During this free spin, the band member that is shown also acts as a wild. When the screen begins to rumble, and the crowd starts to cheer, you have won a random bonus. Often this will be the Appetite for Destruction bonus, where the five band members are wild in the form of a cross. 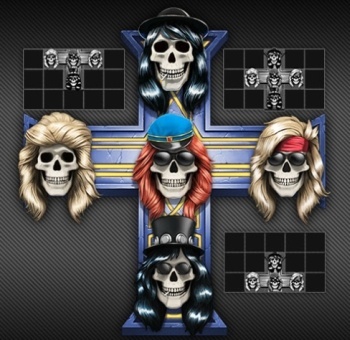 This cross with the band members in it is also known as the band’s logo on the cover of their critically acclaimed masterpiece Appetite for Destruction — a masterful little touch from Netent which again shows that they have gone all out in designing a fantastic slot. Land the cross in the middle and you will surely get a very nice payout! Our least favourite bonus although you can rack up some huge wins. You get a random multiplier of up to 10x. Our big problem with this bonus is that it just takes way to long for the bonus to end without any way of speeding it up. This is also a random bonus and awards the player with 3 free spins, with one to two full reels wild during the spins. This is a bonus that can take you by surprise. Netent has delivered with this great slot. It looks great, it plays fantastic, and the bonus features hit often. The option to choose your soundtrack is a winner in our book, and the design of the slot is mind-blowingly good. All the big and small nostalgic rock and roll details will please old and new rockers alike. The Guns N’ Roses slot is a medium variance slot, giving you lots of playing time for your money. The return to player percentage is 97% which is very impressive, just missing our top 10 of best-paying slots. Netent has two other “Netent Rocks” releases coming in 2016: the Jimi Hendrix slot, which is scheduled for release on April 21st and the Motorhead slot that will come out on the 22nd of September. Play Guns N’ Roses at Slots Million with a 100% bonus up to $100 and 100 free spins.